Alfred Music Publishing is proud to expand its Greatest Hits series with two brand-new songbooks featuring this year’s biggest hits: 2010 Greatest Pop & Rock Hits and 2010 Greatest Country Hits, both arranged for piano and voice, including chords for guitar. 2010 Greatest Pop & Rock Hits brings you this year’s best in music, from pop gems to hard rockers, in a stunning folio of hits from 2010! More than 200 pages of sheet music capture the year's most memorable songs to play and sing for a lifetime, by favorite music groups such as Justin Bieber, Carrie Underwood, Daughtry, Green Day, Michael Jackson, Miley Cirus, The Swell Season, and more! Titles: 21 Guns (Green Day) * Baby (Justin Bieber featuring Ludacris) * For Your Entertainment (Adam Lambert) * Halfway Gone (Lifehouse) * Haven't Met You Yet (Michael Bublé) * Low Rising (The Swell Season) * Need You Now (Lady Antebellum) * Never Gonna Be Alone (Nickelback) * No Surprise (Daughtry) * Party in the U.S.A. (Miley Cyrus) * Temporary Home (Carrie Underwood) * This Is It (Michael Jackson) * Uprising (Muse) * and many more. 2010 Greatest Country Hits is the ultimate collection of this year’s chart-topping country hits from 2010, with everything from inspirational ballads to uptempo rockers. More than 170 pages of sheet music capture the year's best in country music, featuring incredible country stars such as Lady Antebellum, Carrie Underwood, Tim McGraw, Jimmy Buffett, Rascal Flatts, Reba, and more. Titles: American Honey (Lady Antebellum) * Consider Me Gone (Reba) * Cowboy Casanova (Carrie Underwood) * Do I (Luke Bryan) * Gimme That Girl (Joe Nichols) * The Man I Want to Be (Chris Young) * Need You Now (Lady Antebellum) * Small Town U.S.A. (Justin Moore) * Smile (Uncle Kracker) * Still (Tim McGraw) * Strange (Reba) * Summerzcool (Jimmy Buffett) * Unstoppable (Rascal Flatts) * Wrong Baby Wrong (Martina McBride) * and many more. 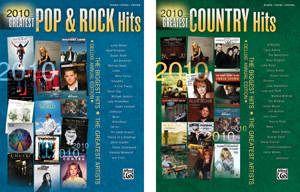 2010 Greatest Pop & Rock Hits and 2010 Greatest Country Hits piano/vocal songbooks are now available for $19.99 each. Pick up your copies at a local music retail store, or buy them today at alfred.com.